It has been said that Florence Nightingale was the first to use diagrams for presenting statistical data. This is not true, of course, but she may have been the first to use them for persuading people of the need for change. Minard's diagram includes a temperature chart which misleadingly suggests that Napoleon's army froze to death. It shows the falling temperature during the retreat from Moscow, but most of the army was lost during the advance (300,000 men, vs. 90,000 in the retreat). Nightingale herself studied this catastrophe, and concluded that Napoleon's army - like most others - had died of disease2. Like Minard's, Nightingale's most famous graphics illustrated what she called the "loss of an army" - the British army sent to the Crimea. She published them ten years before Minard's. Hers also were more topical and conveyed a call to action - they were prescriptive rather than descriptive. She used recent data to persuade the Government to improve army hygiene. Playfair used this graphic to argue for lower taxes. 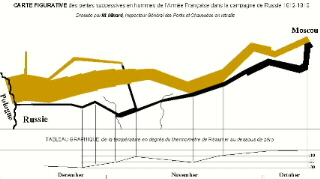 So you could say that, unlike Minard, his graphics are prescriptive. But Playfair's graphics are merely comparisons. They do not demonstrate what would happen if you reduced taxes. They look good but make you ask "so what?" They do not illustrate cause-and-effect - what Nightingale called a "law". Before going into Nightingale's graphics, let's look at the state of statistical science in her day. There was a great revolution in this area in Nightingale's time. In 1837 the General Registry Office at Somerset House, led by William Farr who later helped Nightingale with her Crimean statistics, began to systematically record births, deaths, and marriages in the UK. This gave people the opportunity to examine new cause and effect relationships using registration statistics. Neison estimated the level of education in each county by counting the proportion of people getting married there who were able to write their name on the marriage certificate. 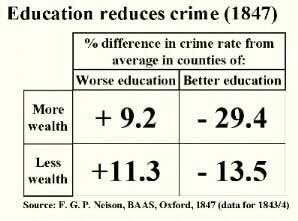 Statistics relied much more on ingenuity and less on complicated formulae in 1847! Social improvers like Florence Nightingale eagerly seized on results like Neison's which showed how mankind could combat social evils. Part of her interest in statistics was related to her Unitarian faith. Unitarians believed that mankind has the power to continuously improve itself by observation and the use of reason. Appendix 72 of the report of the Royal Commission that Nightingale organised after the war, published in 1858. Mortality of the British Army (1858), a private edition by Nightingale of the above Appendix, with exactly the same content but with better layout than that used by Government printers. She produced 2000 copies of this book. A Contribution to the Sanitary History of the British Army (1859). Nightingale published this anonymously to answer a pamphlet4 that claimed that she had exaggerated the number of deaths in the war. She showed that the Army's own figures, released in late 1858, showed that on the contrary she had underestimated. The graphics in the Contribution used the same statistics as in No. 2 but with different graphic presentation, as we shall see. Notes on Matters Affecting the Health of the British Army (1858). This was a confidential report to the Government, that Nightingale printed privately and sent to a number of people. This contains two of the three graphics from No. 3. England and Her Soldiers (1859) by Harriet Martineau. Nightingale encouraged Martineau to write this book about the war and gave her copies of the graphics used in No. 3. Most of the graphics used in Nos. 1 and 2 are similar to those previously used by her adviser William Farr in his Registrar-General's Annual Reports. 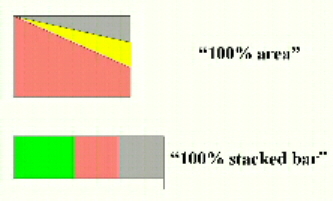 They are mostly what we might call "100% area" or "100% stacked bar". There is also one "honeycomb" graphic showing how densely soldiers are packed in camp (a device which Farr had already used for illustrating urban density), and two other graphics that are highly original. The first is what Nightingale called the "bat's wing" which is very gloomy to look at and also misleading. The circle on the right has 12 sectors going clockwise representing the first 12 months of the war. The circle on the left is the second 12 months. The superimposed dark shapes show the monthly death rates. The diagram illustrates how the Sanitary Commission, sent out in the middle of the war, dramatically reduced the death rate. The length of the radial line in each month is proportional to the death rate, but both the text and the appearance imply that it is the shaded area that is proportional to the death rate, rather than the length of the radial lines. Florence recognised this error and inserted an erratum slip, but then replaced this diagram in later documents (nos. 3, 4, and 5 listed above) with what I will call the "wedges" diagram. This "bat's wing" and its successor are so different from any diagrams that Farr did before that they may be Nightingale's own invention. The other highly original chart is what I will call the "Lines" - a bar chart showing how soldiers in peacetime, living in their barracks in England, were dying at a faster rate than civilians in the cities around them. 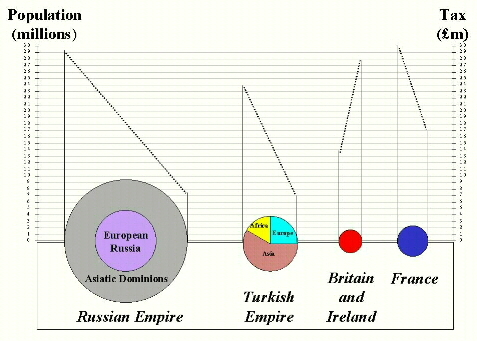 There is a black bar in each of four age ranges, and a longer red bar. The black bar is the number of civilians who die each year, and the red is the number of soldiers. There are a number of curious overtones to this graphic, which may just be a coincidence. First, the title "Lines" (in ornate script in the original) makes it sound like a poem, as in Lines on the Death of Bismarck. There are four pairs of bars, when actually the message is clear from one pair alone. There seems to be a kind of repetition, as in a chorus. This effect is increased by the words, repeated at the end of each line, English Men, English Soldiers ... It sounds like a funeral march. Second, the red bar for the soldiers would certainly make some people think of the "Thin Red Line" which had become famous in the Crimean War when a two-deep row of red-jacketed British infantrymen stopped a Russian heavy cavalry charge, something that was thought to be impossible. 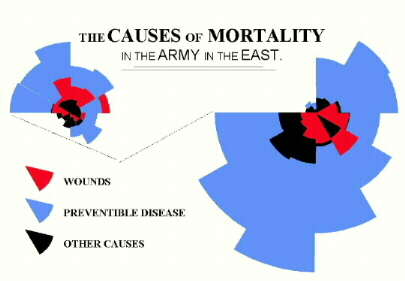 The thin red lines on Nightingale's chart represented these same heroic soldiers who were now dying unnecessarily because of bad hygiene in their barracks. Perhaps this graphic is a visual poem by Arthur Hugh Clough, who was Nightingale's secretary at the time that she produced it5. The variation of death rates due to differences in hygiene was very important to reformers like Nightingale because it showed that even the civilian death rate could probably also be improved by better hygiene. One of Farr's rules of thumb was that if something varied widely from place to place, it could probably be reduced to zero. This is an example of the army being used as a controlled environment for testing social theories, which was very common in Victorian times. This "Lines" graphic is probably the most influential of Nightingale's diagrams because it dealt with a situation that was still going on. The "bat's wing", on the other hand, described a wartime catastrophe which was now history so that the army could claim that it wouldn't happen next time. 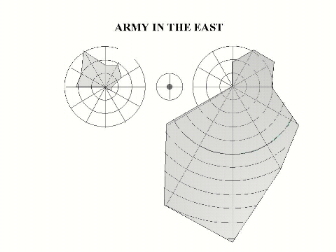 It was probably the "Lines" diagram that Nightingale particularly wanted to frame and send for hanging in the offices of the Army High Command, as a rebuke6. However, it is the last graphic - the successor to the "bat's wing" which I will call the "wedges" - that Nightingale is most famous for. Strangely enough, the name that many people give it is wrong. This graphic is not what Nightingale referred to as the "coxcomb"! 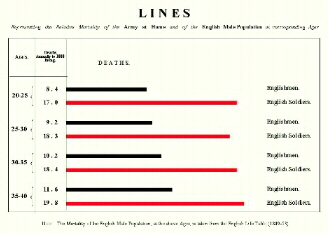 In this diagram, Nightingale resolved the problem of the "bat's wing" by using areas to represent the variation in the death rate, instead of the length of radial lines. The blue wedges, representing death by sickness, are far bigger than those representing wounds. The message of this graphic is twofold: first, most of the fatalities during the war were from sickness and second, improvements in hygiene dramatically reduced the death rate. Nightingale used this diagram instead of the "bat's wing" in documents 3, 4, and 5. But why do I say that this is not the "coxcomb"? What did Nightingale mean by the word "coxcomb"? She never used the word to refer to a diagram. The "coxcomb" booklet that she was referring to in December 1857 did not even include the colourful "wedges" diagram, because that didn't appear until late in 1858. The booklet to which she was referring, published at the beginning of 1858, included the old bat's wing diagram which was erroneous and which she replaced by the wedges later that year. It is easy to see why the error has persisted: the diagram resembles the crest of a helmet. In briefly surveying Nightingale's statistical diagrams this paper is guilty of the superficiality which Nightingale predicted, because it has focused on the coxcomb of her report and ignored the real issues of substance. For example: was her conclusion justified? Did sanitary improvements reduce the mortality, or was it the reduction of trench duty as some army doctors claimed? And the most important question of all: did she achieve real success with these arguments, in terms of reducing the mortality of the population as a whole? These questions will eventually be answered by a more thorough evaluation of material in Nightingale's archives and elsewhere. BL Add. MSS 43394, f210. 25/12/1857. ff 215 and 219 also refer to the "coxcombs" as books. Appendix 72 of the Royal Commission report was printed in double columns, but her Mortality of the British Army is single column. From her letter, it appears that there were 300 deluxe copies. Cook, Life of Florence Nightingale, vol. 1, p. 386. Possibly the only book which more correctly associates the word "coxcomb" with the "bat's wing" diagram is Sue Goldie's Florence Nightingale in the Crimean War (1987), p. 94.